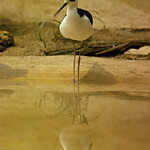 The black-necked stilt has black-and-white markings with long, thin red legs. Throughout the year the black-necked stilt is found in Florida, Central America, northern South America and Brazil. During the summer, the species migrates to pockets of the central and western United States. The black-necked stilt is considered a species of least concern by the International Union for Conservation of Nature. 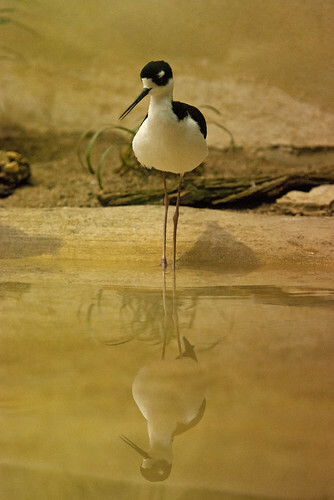 Lincoln Park Zoo participates in the Black-Necked Stilt Species Survival Plan®, a shared management effort by zoos throughout the Association of Zoos and Aquariums. Wetland habitats including estuaries and salt ponds. The species uses its long, thin bill to probe wetland mud for insects and crustaceans. Black-necked stilts nest on the ground in their wetland homes. The female lays three-five eggs, which the male and female incubate cooperatively. Young can run and swim soon after hatching but remain dependent on their parents for roughly six weeks.